I went to check my beehive two days ago since the weather was nice and the temp was over 50 degrees. I brought 2 gallons of 1:1 sugar water to feed them to help them fuel up for spring while waiting for the dandelions and trees to flower. We had had a very cold winter with about 45 consecutive days below freezing but I was hopeful. I had observed a little feces on the front of the hive at the top entrance which I hoped was a sign that when things got warm enough a few bees were able to part from the cluster and take a potty break. When we opened the hive we were hoping to see a ball of bees still keeping warm as they slowly traveled through the hive consuming what honey they had put up for the winter. That was not what I found. Instead I saw no live bees, a lot of capped honey and a feeder that was still half full from last year. It looks as though they did not starve but rather froze. Bees seem to know how much food they have and how many bees get to stay in the hive for the winter to keep the Queen warm based on available food and other things bees need. It seems that maybe the bee cluster was too small and they could not generate enough heat to keep alive so as some bees died the cluster got smaller and harder still to keep warm. It is possible that since they did not have enough honey in the top section of the hive that they had to choose between staying lower where the honey was and rising up where it was probably warmer or easier to keep warm. Total bummer for me. Total bummer for the bees. So moving forward we gave the hive a good cleaning and removed a bunch of propolis and burr comb . I will resupply the hive with at least 2 swarms this spring and this should help them build more comb and honey for next winter. 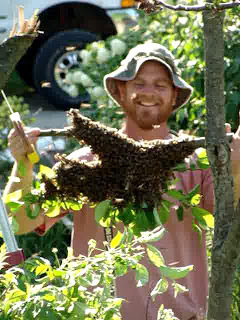 This is a learning experience and had it been a milder winter I would probably be learning more about spring feeding and how to clean a hive with 8,000 residents to be courteous with. It is easier to clean the hive at this time of the year because at the end of the year there can easily be 60,000 bees to work with and every one of them wishing you would leave their honey and pollen stores alone. Either way I look at it the bees brought benefit with their presence in our garden. Their pollinating services, I’m sure, made a large contribution to my garden and the unknown numbers of gardens in the area. I believe they reduced the number of other flying stinging insects in the immediate area. They were a reason to meet and learn about bees from a number of very nice, experienced beekeepers (perhaps I should have asked more questions) and they were the source of educational entertainment for my whole family and every person that came to visit the garden where they are kept. But such is the way of nature. Each new season brings it’s issues and it’s lessons and it’s opportunities to move forward. And move forward we will with new bees and a new found skill. Bee hunting. I want to discuss the warmer weather and the emergence of honey bee swarms. Swarms are actually a good thing. They usually meant that a happy and healthy colony of bees has outgrown it’s domicile and about half of them are looking for a new home. They all get fattened up on whatever honey they can consume and almost simultaneously head out in search of a new home. They often land quite close to the original hive and send out scouts to look for a suitable residence. 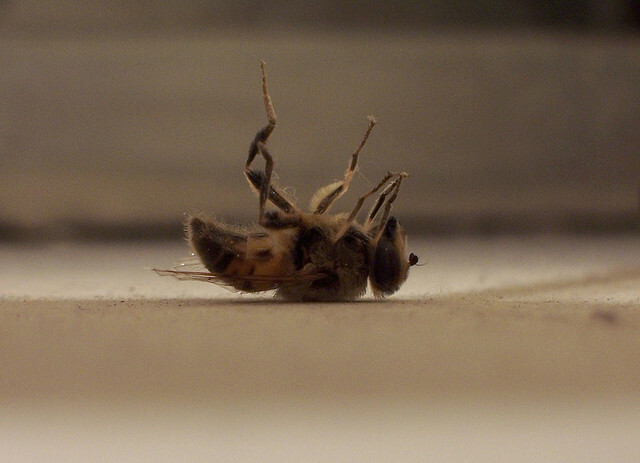 It is during this time that people see bees in a yard or on a structure and call for help. They call the police, pest control companies, brave neighbors. Often the police refer the caller to pest control companies. Pest control companies hopefully redirect the caller to a local bee keeping club resource. 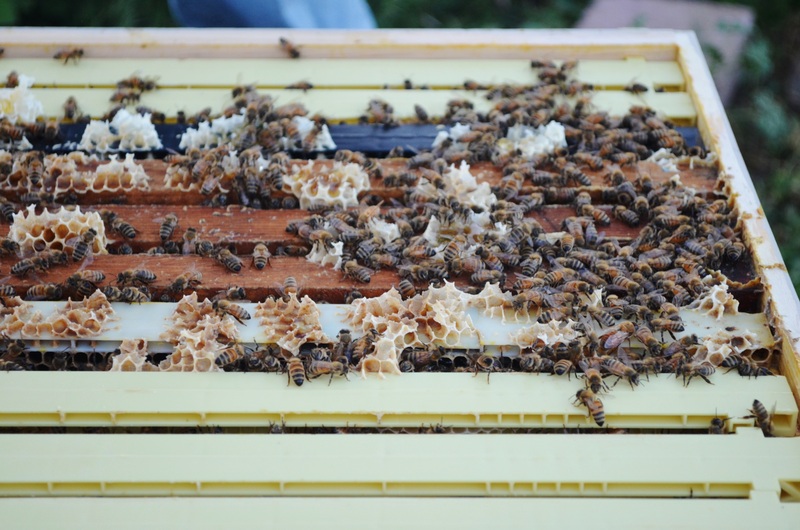 There are about 3500 regional bee keeping clubs and organizations across the United States. Those resources can put the concerned caller in touch with a person that will collect the swarm with as little disruption of the landscape as possible. 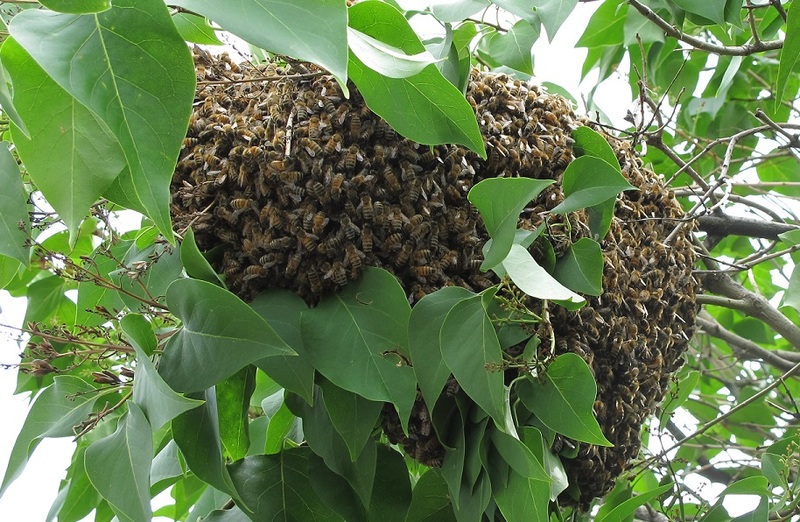 Sometimes a branch or a small limb must be cut to carry the swarm, en masse, to a box or bucket or other suitable container. These bees are often incorporated into that persons owned colonies. It is important to note here that the bees are full for the trip and have no brood (unhatched young) to protect and the queen is nestled safely in the center of the swarm. They have almost no reason to be defensive and, contrary to common misconception, are quite happy, calm and tolerant of others at this time. DO NOT APPROACH THE BEES. In case you have mistakenly identified a swarm of any other flying insect it is best to keep your distance but panic and fear are not necessary. This is where we mention calling a brave neighbor. Brave neighbors showing up with thoughts of spraying, burning, smoking, drowning bees are misguided, uninformed and a one person recipe for disaster. If they kill the bees they have wasted a natural resource that has a tremendous benefit to that local community. If they manage to annoy the otherwise happy bugs, they are running the risk of getting stung hundreds of times or risking the surrounding neighbors safety as well. Once the bee keeper has arrived they often discuss the plan for removal with all concerned parties. They may invite others to even don protective clothing and assist with the handling of the bees. 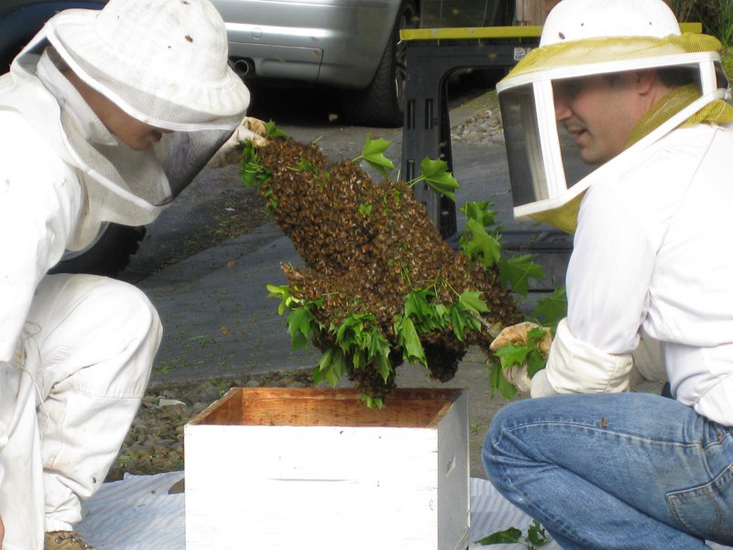 The removal is often done into a box or bucket by shaking or giving a quick motion to cause the bees to drop. It can be done with a specialized vacuum. 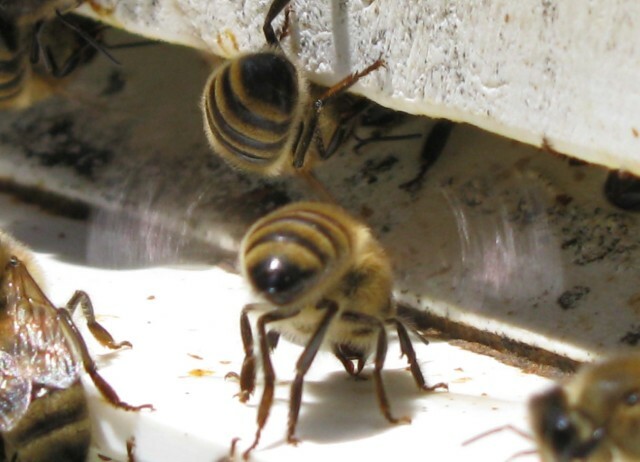 It can also be done by shaking the majority of the bees directly into a bee hive and then allowing the bees in the hive to signal the remaining bees to join them by standing all around the entrance and fanning a pheromone into the air with their wings. When they do this the bees outside the hive begin landing and marching into the hive in continuous procession. This is an amazing display of chemical communication. Once the bees are collected the bee keeper will transport them to their apiary (bee yard) and give them a hive of their own or incorporate them into another colony over the next few days. 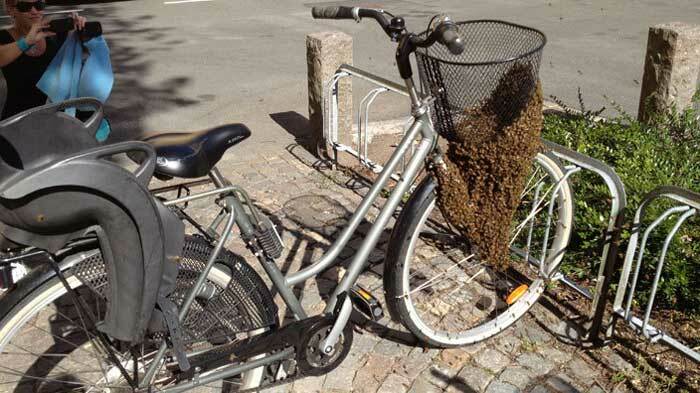 So remember, if you see what you think is a swarm of bees DON’T PANIC. Don’t approach them. Try to contact a bee keepers resource and have these amazing, pollinating, honey making insects brought safely (for everyone) to a new home.